Washington Middle School eighth-grader Quintin Hart practices heart compressions during CPR training at the school on Tuesday. Washington is the first school to take part in the training by the American Heart Association, which aims to teach CPR to every seventh- and eighth-grader in Missoula County Public Schools. Eighth-grader Tricia Johnsen looks over her "Mini Annie" after inflating it. Each student is being given the CPR training kit in hopes they will not only continue to practice, but also teach their family and friends. Washington Middle School students practice chest compressions during the program. After calling 9-1-1, compressing the heart through the sternum at a rate of 100 per minute is now said to be the most important step of CPR. In the unfortunate chance that Washington Middle School principal Paul Johnson has a cardiac episode in the future, he's going to want it to happen right at his school. It may be one of his students who saves his life. "I was just talking to a couple of kids, and I told them I want to be standing close to them if I start feeling any chest pains," Johnson said as a gym full of eighth-graders learned how to compress a heart and keep a body's blood flowing on Tuesday morning. In a program launched by the American Heart Association and adopted by the Missoula County Public Schools district, every seventh- and eighth-grade student has begun learning basic CPR - especially the most critical first step, which is to compress the heart through the sternum. Every student over the next couple of months will go through the training, and receive a kit containing a DVD and a "Mini Annie," a truncated version of the full "Resusci Annie" used to certify people in CPR. The goal is to not only help students learn how to save a life, but to have them train their own families and friends in the skills, said Maria Sweeten, community CPR manager for the western states affiliate of the heart association. "About 80 percent of cardiac incidences happen in the home with no trained bystanders," said Sweeten, who traveled to Missoula from Salt Lake City for the training sessions. "So in this project, the kids take these kits home and they have everything for them to learn Hands-Only CPR." The trademark name Hands-Only CPR stems from recent medical studies that show giving compressions - and at a particular rate of 100 per minute - is the first and most important skill a would-be lifesaver should have. "Call 9-1-1, then push hard and push fast," said Sweeten, outlining the lifesaving strategy. "It's like that song, ‘Staying Alive.' That's the rhythm we want them to do." After all MCPS seventh- and eighth-graders are trained, the program - called CPR Anytime - will also be taught to hundreds of other middle-school students in Frenchtown, Lolo, Clinton, Hellgate Elementary, Valley Christian and other places. "We're looking to train up to 2,000 kids in the whole valley," said Bill Mathews, regional director of the AHA, based in Missoula. "MCPS is the first round of schools, and there will be another 12 in the valley." The kits are $25 apiece, but not one dollar has had to come out of the MCPS budget or any other district's budget. The MCPS kits were purchased by Community Medical Center through its foundation. "I think it's a great way to invest in kids and empower them to be able to educate themselves, and then educate others," said Jean Jenkins, executive director of the foundation. Additional funding for kits outside of MCPS comes from St. Patrick Hospital, the Missoula Federal Credit Union, the Dennis and Phyllis Washington Foundation and a host of local businesses. Once most of the seventh- and eighth-graders in Missoula County are trained, Sweeten and Mathews hope to continue the program every year for all seventh-graders. 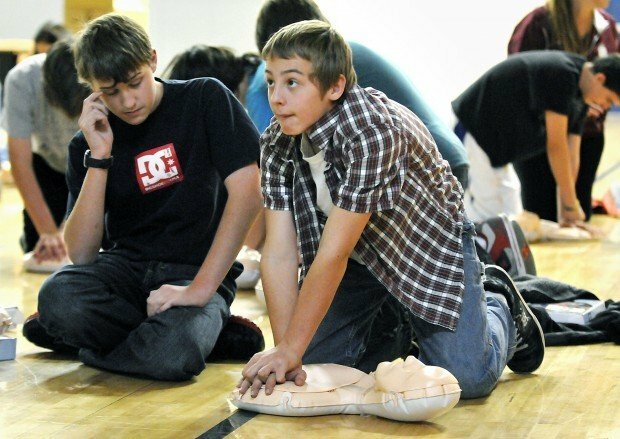 Seventh grade is the "optimal time" for students to learn basic CPR, said Sweeten. And the optimal time, too, for the students themselves to spread their knowledge to others. "It might end up being 4,000 or even 5,000 community members who learn this," she said. "And that greatly impacts the chances of survival." Reach reporter Jamie Kelly at 523-5254 or at jkelly@missoulian.com.